auch in der aktuellen Ausgabe der structure. sche Ingenieurbauten und ihren Entwerfer. be more robust and require less maintenance. historical structures and their designers. Karl Bernhard’s Stössensee Bridge in Berlin. ­Calais and Mactan Airport on the Philippines. In 1899, the Berlin authorities decid­ ed to extend Bismarckstrasse to link the urban centre to the Grunewald, an extensive wooded area to the west referred to as the “heart and the lungs” of the city. The new road, Heerstrasse, was intended to relieve traffic from Kurfürstendamm and ­provide the capital with a boulevard modelled on those of Paris and Lon­ don. The planned road had to cross the lakeland area in west Berlin, which would require two bridges. Karl Bernhard, one of the most influ­ ential master builders in Berlin at the start of the 20th century, was com­ missioned with the planning, design and construction. The 1909 Stößensee Bridge is consid­ ered one of his most beautiful and best-preserved structures. In order to reduce the length and therefore the cost of the project, Bernhard crossed part of the lake with a 350 m long, 125 m wide embankment, which al­ lowed some of the marshland to be excavated, drained and put to good use. To ensure that the resulting beautiful, almost 100 m wide valley would not be marred by massive ­masonry piers, Bernhard chose to de­ sign a delicately proportioned steel truss girder superstructure with a simi­ larly slender and open single steel central support in the valley. A longspan arch was ruled out because the horizontal forces could not be resist­ ed at reasonable costs by the em­ bankment fill. Morandi-Brücke in ­Genua: Die im Sommer 2018 eingestürzte ­Brücke war aus statischer Sicht wenig redundant entworfen. D–F Der Ersatzneubau der ­Eisenbahnbrücke LangeFeld-Straße, Hannover, ist ein neuer Brückentyp für die Deutsche Bahn: Der extrem schiefwinkli­ ge Stahltrogüberbau wurde monolithisch mit dem Wider­lager verbun­ den, um bei der Stütz­ weite die Konstruktions­ höhe zu optimieren und komplizierte ­Lager mit Zugverankerungen zu vermeiden. Morandi Bridge in Genoa, which collapsed in summer 2018, was de­ signed to have very little redundancy in terms of structural behaviour. D–F the replacement LangeFeld Strasse railway bridge, Hanover, is a new type of bridge for Deutsche Bahn AG: the extremely skewed steel trough deck was connected monolithical­ ly with the abutment to optimise the construc­ tion depth for the span and avoid using com­ plicated bearings with tensile anchors. G  Bauwerk aus den 1950er Jahren: Die Stennert­ brücke über die Lenne in Hagen war eine der ers­ ten Freivorbaubrücken in Deutschland. Ihr Bau­ zustand ist gut. Sie soll viele Jahrzehnte weiter­ genutzt werden. Der rech­ nerische Nachweis des Ankündigungsverhaltens bei möglichen Spann­ stahlbrüchen konnte ­jedoch nicht erbracht werden. H Für eine Langzeitprogno­ se werden seit Juni 2018 mittels Sensoren und Mo­ nitoringsystem mögliche Spanndrahtbrüche aufge­ zeichnet. G s tructures from the 1950s: Stennert Bridge over the Lenne in Hagen was one of the first balanced canti­ lever bridges in Germany. The bridge is in good structural condition. and should continue in opera­ tion for many years. It was not possible to prove by calculation that the bridge would show any tell-tale changes in be­ haviour in the event of prestressing steel deteri­ oration. H sensors and a monitoring system were installed in June 2018 to provide continuous prognoses of possible prestressing wire breakages. bereits vergessene Entwurfsansätze voranzu­ bringen und bessere Bauwerke zu errichten. Wichtige Kriterien aus heutiger Sicht sind dau­ erhafte, robuste und materialgerechte Konst­ ruktionen, ein ressourcenschonender Baustoff­ einsatz, zeitlose Gestaltung sowie eine gute Rückbaubarkeit und Wiederverwertbarkeit der Materialien. Die computergestützte Statik erlaubt uns heute eine genaue rechnerische Überprüfung der Ansätze und unterstützt uns Ingenieure beim Finden optimaler Lösungen. Dennoch stoßen die neue digitale Welt und hochspezialisierte Berechnungsmethoden ­allein keine neuen Entwicklungen im Brücken­ bau an. Dies kann nur mit dem Wissen des Machbaren und der Kreativität im Umgang mit den Werkzeugen gelingen. In den letzten Jahren haben die Aufgaben zum Erhalt, zur Nachrechnung und zur Ertüch­ tigung älterer und historischer Brücken deut­ lich zugenommen. Die vorhandene Bausubs­ tanz hat nicht nur einen geschichtlichen oder kulturhistorischen Wert, sie ist auch ein enor­ mer Ressourcenspeicher. Der Bau unserer ­Infrastruktur war mit erheblichen finanziellen Aufwendungen und dem Verbrauch großer Mengen an Energie und Material verbunden. Allein vor dem Hintergrund der Ressourcen­ schonung ist der Erhalt von Brückenbauwer­ ken eine der wichtigsten Aufgaben der Ge­ genwart und der Zukunft. Die Frage der Be­ treiber, wie lange ein Bauwerk noch benutzt werden kann, muss künftig anders gestellt werden: Was ist zu tun, damit das Bauwerk seine Anforderungen dauerhaft erfüllt? Hier treten gänzlich veränderte Fragestellungen als bei der Planung neuer Brücken in den Vor­ dergrund. 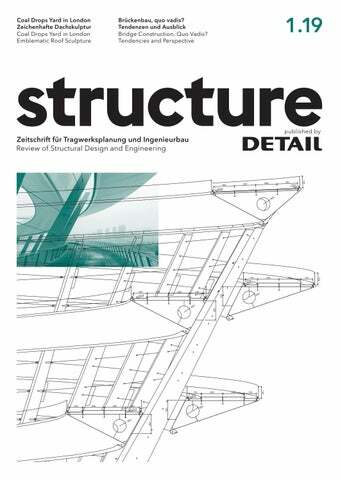 Text: Ed Clark Der Autor ist Direktor bei Arup und leitet eine multi­ disziplinäre Abteilung für ­Gebäudeentwurf in London. Er führte das Planungsteam des Coal Drops Yard-Projektes von der Konzeptentwicklung bis zur Fertigstellung. Ed Clark is a Director of Arup and leads a multi-disciplinary building design group in London. He was head of the structural engineering team for the Coal Drops Yard project from concept through to completion. elementen wurden alle Keramikplatten auf der Rückseite mit einem Identifikationscode versehen, um die exakte Position sicherzustellen. Undercut System for a Residential Complex The residential complex realised by Daniel Libeskind in Berlin is called Sapphire. The association with the gemstone is mainly due to the facade, which has a complex shape, with many asymmetrical elements and the complete renunciation of right angles. The colour of the outer cladding is also that of a blueish shimmering sapphire. Bioactive, self-cleaning porcelain stoneware slabs with a relief, metallic surface were used for the completely ventilated facade. The geometry of the facade allowed only 500 elements in the standard 60 ≈ 120 cm format. The remaining 3100 ceramic tiles had to be cut to size according to precise worksheets from the construction drawings of the facade surface. This facade was made possible by a fastening technique that fixes the ­panels invisibly. For expansion-pressure-free mounting with the undercut anchors from Keil, the number of system drillings determined in the statics was drilled on the reverse side of the ceramic elements, with the bottom of the drill holes widened – so-called undercut drillings. Standard-dimension tiles required four such drill holes, but up to eight on the elements with special dimensions, depending on the dimensions and special features of the fastening situation of the individual facade components. In view of the large number of special elements, all the ceramic plates were provided with an identi­ fication code on the back to ensure exact positioning. Einfacher Rückbau dank mechanischer Verbindungen Im dänischen Aarhus entsteht derzeit das erste komplett recyclingfähige Gebäude der Welt. Beim Circle House arbeiten Hersteller, Bau- und Abbruch unternehmen branchenübergreifend zusammen. Es besteht aus 60 Sozialwohnungen in Reihenhäusern. Für die Planung verantwortlich zeichnen 3XN Architects aus Kopenhagen. Das ­Circle House ist so konzipiert, dass nur vier Arten von Platten- und Wandelementen verwendet werden. Ein­ fache mechanische Verbindungen ­ermöglichen das Recyceln von Bau­ teilen und Materialien, wenn das ­Gebäude später a ­ bgerissen werden muss. Peikko hat dazu gemeinsam mit GXN Innovation, der Entwicklungsabteilung von 3XN, ein Forschungsprogramm angestoßen, das neue Lösungen für kreislauffähige Bausysteme in der Fertigteilindustrie entwickeln soll. Easy Dismantling Thanks to Mechanical Connections The first completely recyclable building in the world is currently being constructed in Aarhus, Denmark. Manufacturers, construction companies and demolition companies from various industries are all working together on Circle House. The complex consists of 60 subsidized apartments in terraced houses, with 3XN Architects, Copenhagen, responsible for the planning. Circle House involves the use of only four types of panel and wall elements, and simple mechanical connections make it possible to recycle components and materials if the building needs to be demolished later. Peikko has joined forces with GXN Innovation, 3XN’s development department, to initiate a research programme to develop new solutions for recyclable building systems in the precast industry. Fassadenbefestigung ohne Wärmebrücken Gemeinsam mit Architekten und Fassadenbauern hat Schöck eine neue thermisch trennende Befestigung für vorgehängte hinterlüftete Fassaden, VHF, entwickelt: den Schöck Isolink Typ TA-S. Der Fassadenanker wurde vom Passivhausinstitut für alle Gewichtsklassen in die höchste Klassifizierung phA+ eingestuft. Er besteht aus Combar in Verbindung mit einer Edelstahlschraube. Combar, ein Stab aus Glasfaserverbundwerkstoff mit geringer Wärmeleitfähigkeit, erfüllt die Anforderungen an den Wärmeschutz. Als zertifizierte Passivhauskomponente ermöglicht das neue System eine rechnerisch wärmebrückenfreie Konstruktion. Vorteil für Planer und Bauherren: Die Dicke der Wärmedämmung lässt sich bei gleichbleibendem U-Wert der Wand deutlich reduzieren. Facade Fixing Without Thermal Bridges Together with architects and facade builders, Schöck has developed a new thermally-separating fastening system for ventilated curtain walls (VCWs) – the Schöck Isolink type TA-S. The new facade anchor has been classified as phA+, the highest classification, by the Passive House Institute, for all weight classes. The Schöck Isolink type TA-S consists of a Combar together with a stainlesssteel screw. Combar, a rod made of glass fibre composite material with low thermal conductivity, is the fastening for VCWs on the market that meets the requirements for thermal insulation. As a “Certified Passive House Component”, the new system enables a theoretically thermal bridge-free construction. The advantage for planners and builders is that the thickness of the thermal insulation can be significantly reduced without altering the U-value of the wall. tain-type, rear-ventilated facades. It consists of a wall bracket made of hotdip galvanised, high-strength steel in combination with a thermal decoupling plate and is fixed to the loadbearing masonry or concrete block using facade dowels and connected, for example, to a T-profile. Due to the enormous load-bearing capacity of the high-strength steel wall bracket, even facade claddings made of natural stone slabs can be ­attached to it. Because of the low thermal conductivity of hot-dip galvanised steel compared to aluminium, facades suitable for passive houses can be constructed. Befestigungssystem für vorgehängte hinterlüftete Fassaden Mit einer neuen Unterkonstruktion bietet SFS nun ein Komplettsystem für vorgehängte hinterlüftete Fassaden an. Das Spektrum an Befestigern ermöglicht Lösungen für unterschied­ liche Anforderungen. So deckt beispielsweise die Produktpalette der Wandkonsolen zahlreiche Ausladungen ab. Standardmäßig sind die Konsolen aus Aluminium. Auch für den Passivhausbau und für hohe Brandschutzanforderungen bietet SFS passende Lösungen. Fastening System for Ventilated Curtain Facades With a new substructure for ventilated curtain facades, SFS now offers a complete system for ventilated curtain facades. The wide range of fastenings offers a solution for different requirements. For example, the wall-bracket product range covers numerous projections. The brackets are generally made of aluminium. SFS also offers suitable solutions for passive house construction and high fire-protection requirements. (4 Ausgaben inkl. Versandkosten / 4 issues including shipping): Inland / Germany: € 79,– / Ausland / Other countries: € 89,– Studenten / Students: Inland / Germany: € 45,– / Ausland / Other countries: € 55,– Ausland zzgl. MwSt., falls zutreffend / Other countries plus VAT, if applicable Abonnements sind 6 Wochen vor Ablauf kündbar. / Subscription ­cancellation 6 weeks before expiry. IBAN: DE24700700100193180700 SWIFT: DEUTDEMM Bei Nichtbelieferung ohne Ver­ schulden des Verlages oder infolge von Störungen des Arbeitsfriedens bestehen keine Ansprüche gegen den Verlag. No claims can be accepted for non­-­ delivery resulting from industrial ­disputes or where not caused by an omission on the part of the ­publishers. Zurzeit gilt Anzeigenpreisliste Nr. 2, 2019 für alle Beiträge, soweit nicht anders angegeben, bei DETAIL Business Information GmbH. Current valid advertising rates are ­listed on Rate Card No. 2, 2019 DETAIL Business Information GmbH, for all contributions, unless otherwise stated. Dieses Heft ist auf chlorfrei gebleichtem Papier gedruckt. This journal is printed on chlorinefree bleached paper. Alle Rechte vorbehalten. Für unverlangte Manuskripte und ­Fotos wird nicht gehaftet. Nachdruck nur mit Genehmigung. Für Vollständigkeit und Richtigkeit aller Beiträge wird keine Gewähr übernommen. All rights reserved. No liability is ­accepted for unsolicited manuscripts or photos. Reproduction only with permission. No guarantee can be ­given for the completeness or correctness of the published contributions. Die Beiträge in structure sind urheberrechtlich geschützt. Eine Verwertung dieser Beiträge oder von Teilen davon (z. B. Zeichnungen) sind auch im Einzelfall nur in den Grenzen der gesetzlichen Bestimmungen des ­Urheberrechtsgesetzes in der jeweils geltenden Fassung zulässig. Sie ist grundsätzlich vergütungspflichtig. ­Zuwiderhandlungen unterliegen den Strafbestimmungen des Urheberrechts. Any use of contributions in whole or in part (including drawings) is ­permitted solely within the terms of ­relevant copyright law and is ­subject to fee payment. Any contravention of these conditions will be subject to penalty as defined by copyright law.